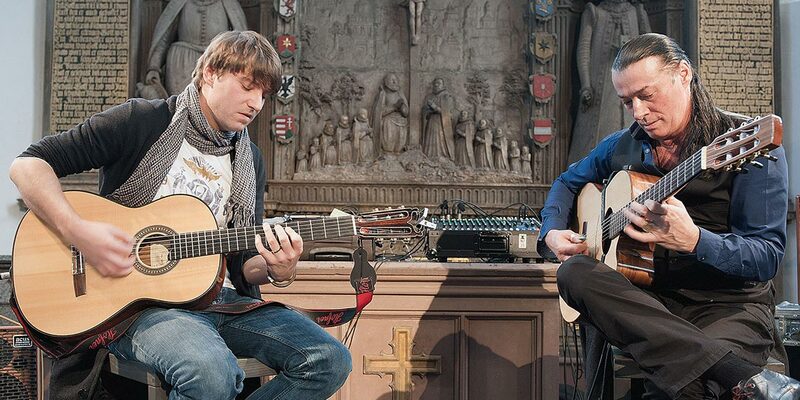 Famed solo guitarists throughout Europe who have gone on to even greater success as a duo, Lulo Reinhardt and Daniel Stelter offer a wide variety of styles and influences that extend from Argentina to Cuba and back to their German Gypsy roots. Lulo, the grand nephew of Gypsy Jazz pioneer Django Reinhardt, is a spontaneous and spirited musician. His curiosity took him to southern Spain in search of flamenco roots and to South America, exploring various musical styles of Latin jazz. Developing an interest in Swing, he began composing Swing materials that he has combined with Latin music. Daniel’s unique guitar style has made him a landmark musician in Germany’s Jazz scene. His sound encompasses jazz, pop and classical music. He began playing classical guitar at the age of 8 and was soon introduced to jazz, rock and pop music. His music speaks for itself; the elaborate instrumentation is the essence. In 2016, Daniel released Live in der Stadtkirche, a “live” CD with Lulo, which instantly became “Record of the Month” in the German NDR Jazz Charts.